As seen in the still image above and the full video below, the rocket failure originated somewhere in the upper stage during fueling test operations at the launch pad, less than two days prior to its planned launch on Sept. 3. The rocket was swiftly consumed in a massive fireball and thunderous blasts accompanied by a vast plume of smoke rising from the wreckage visible for many miles. Both the SpaceX rocket and the $200 million AMOS-6 Israeli commercial communications satellite payload were completely destroyed in the incident. Thankfully there were no injuries to anyone, because the pad is cleared during these types of operations. 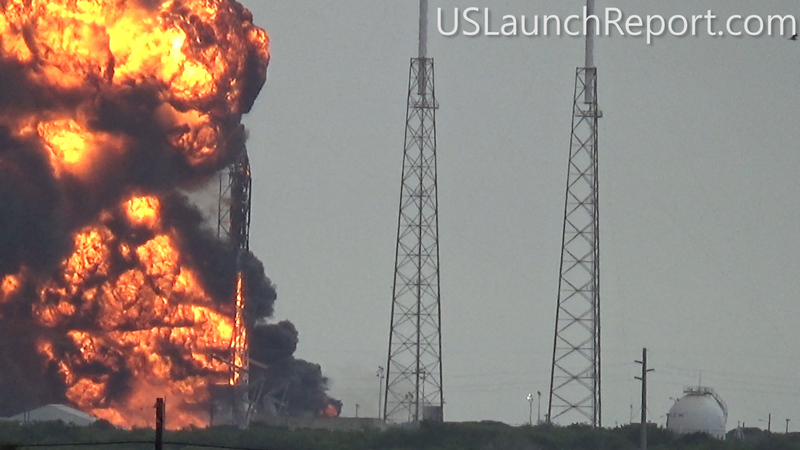 This also marks the second time a Falcon 9 has exploded and will call into question the rocket’s reliability. The first failure involved a catastrophic mid air explosion about two and a half minutes after liftoff, during a cargo resupply launch for NASA to the International Space Station on June 28, 2015 – and witnessed by this author. It took place during this morning’s prelaunch preparations for a static hot fire test of the nine Merlin 1 D engines powering the Falcon 9 first stage when engineers were loading the liquid oxygen (LOX) and RP-1 kerosene propellants for the test, according to SpaceX CEO Elon Musk. “Loss of Falcon vehicle today during propellant fill operation,” tweeted SpaceX CEO and founder Elon Musk this afternoon a few hours after the launch pad explosion. All SpaceX launches will be placed on hold until a thorough investigation is conducted, the root cause is determined, and effective fixes and remedies are identified and instituted. Today’s explosion and the total loss of vehicle and payload will certainly have far reaching consequences for not just SpaceX and the commercial satellite provider and end users, but also NASA, the International Space Station, the US military, and every other customer under a launch contact with the fast growing aerospace firm. The ISS is impacted because SpaceX is one of two NASA contracted firms launching cargo resupply missions to the ISS – along with Orbital ATK. Continued operations of the ISS depends on a reliable and robust lifeline of periodic supply trains from SpaceX and Orbital ATK. In fact the most recent SpaceX Drago cargo freighter launched on the CRS-9 mission to the ISS on July 18 as I witnessed and reported here. And just successfully returned to Earth with 3000 pounds of NASA science cargo and research samples last week on Aug. 26. The SpaceX Dragon launches to the ISS will be put on hold as the investigation moves forward. Furthermore SpaceX is manufacturing a Crew Dragon designed to launch astronauts to the ISS atop this same Falcon 9 rocket. So that will also have to be evaluated. SpaceX is also trying to recover and recycle the Falcon 9 first stage. To date SpaceX has recovered 6 first stage Falcon 9 boosters by land and by sea. Indeed as I reported just 2 days ago, SpaceX announced a contract with SES to fly the SES-10 communications satellite on a recycled Falcon 9, before the end of the year and perhaps as soon as October. But this explosion will set back that effort and force a halt to all SpaceX launches until the root cause of the disaster is determined. Cape Canaveral Air Force Station Emergency Management quickly provided initial on-scene response and set up roadblocks, said the Air Force in a statement. “Days like today are difficult for many reasons,” said Brig. Gen. Wayne Monteith, 45th Space Wing commander. I really think we need to wait and see what exactly happened here. Obviously this was not a problem with the Merlin Engines. Since this was a problem that occurred during fueling, was this a problem with the Falcon 9, or some other issue related to the fueling procedure? Just watched. I thought I seen a shake or two near the top just before the explosion. Gosh was that a bad disappointment. If you ask me, its an odd place for an explosion unless you hold a spark there. I was thinking the same thing, but I hear the same sort of hissing sound after the explosion…could be some noise near the camera position? I can hear that the mic gets some influence by pressure differentials (caused by wind), but that was not it. The frequency difference and duration between the sounds is to huge to mistake it for hissing. But whatever happend, It was roughly 10 sec before the explosion. Sounding like the snap of a valve, followed shortly after by a rush of gas flowing audibly for a second or so, than a moment of normal sounds followed by a bang. I guess, it was seconds before something sparked. Or something similar sounding but different … ! It’s hard to know without a second and third microphone so we can triangulate on the sources of these sounds. The explosion took about 10 seconds to reach us, which puts us over 3 Km away, so the hissing noises could be nearby and 10 seconds earlier (this is my bet, because I don’t see any corresponding jet of cold gas from the rocket). I imagine this sort of calculation is what SpaceX are doing right now. would it have been a good idea to carry out the firing test and then add the pay load or is this not practical? To me, this looks like a propellant tank rupture. Overfilling due to an measurement/instrumentation error/failure?? It is a good question why they risk destroying the satellite during these tests. The explosion happened at the top of the rocket. This is where the fuel tanks stop, and we have the mountings for the payload, and other stuff. The oxidiser tank is sited above the fuel tank, so the top of the rocket will be colder, and may be brittle if there is any problem with the alloy composition of any part. Do you want to be up there with a spanner bolting on the payload? Not me, pal. You are assuming that the test of the main engines must be done with full fuel. There are arguments against this, and the only real one for full fuel is that the weight helps hold the rocket down on the launch pad. Great interview Ken! Of course, the BBC is heard around the world. Must be kind of exciting knowing that? I would be! Between you & Mr. Kirk, we seem to have gained an estimated range to mic pick-up of ~3.4 km (+/- 0.4 km). I bet with a little work (calculating difference in Mach due to pressure/temp/humidity, a more accurate stopwatch, etc.) we could do better, but I bet it would land somewhere in these error bars. I have often wondered if it would be worth the expense to have an escape system for payload capsules much the same as they would for human cargo. If it’s still unclear, darderg, I’d advise trying to watch the video in HD — at least 480p, higher if bandwidth allows — on the YouTube site, then slowing the video down using the viewer settings to either .5 or .25 speed. It becomes pretty clear at those settings that these are birds in the foreground, and nothing near the rocket itself. Previous PostPrevious What is the Largest Desert on Earth?